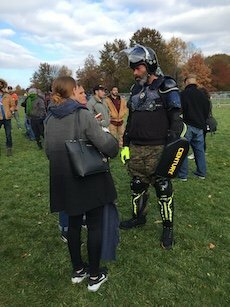 Before the 'We the People' rally wrapped up on Independence Mall, attendees were urged to exercise caution leaving the area. Soon would come reports that a Jewish man was attacked when protesters had apparently mistaken him for a member of the 'Proud Boys' group. Along the north side of Market Street on Independence Mall stood a couple dozen members of the “silent majority” who gathered together – with a permit – to celebrate the U.S. Constitution at the “We the People” rally. 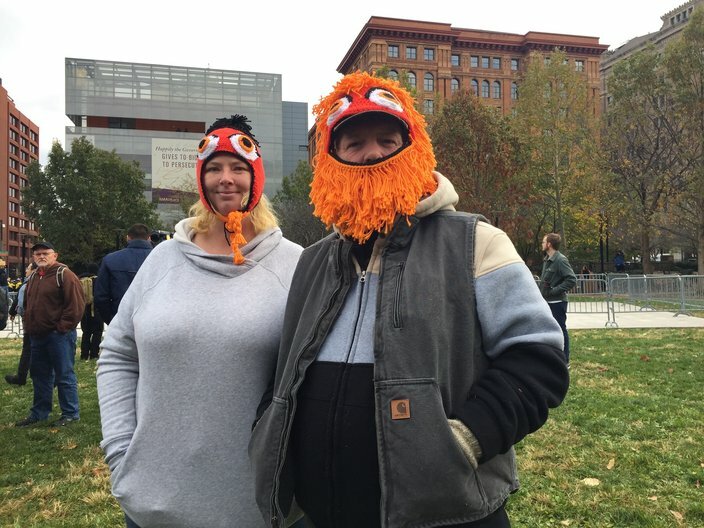 On the south side of the block, with Independence Hall serving as their backdrop, were several hundred protesters who chanted and held signs – many of which prominently featured the Flyers mascot Gritty – in an effort to shout down the foes that they deemed racist, members of the controversial Proud Boys group or outright Nazis. Separating those rival factions were officers from Philadelphia police and National Park Service who drew a Saturday assignment of keeping a precarious peace. Though the days leading up to the event were accompanied by an uncertainty as to what would happen, the event was – for the most part – calm, with just four arrests reported for offenses including disorderly conduct and failure to disperse. One occurred as officers were pushing protesters back across Market Street around 10:15 a.m., while the others resulted from tensions flaring up as the events were ending. In one violent turn, a Jewish man was attacked by protesters after he was reportedly mistaken him for a member of the Proud Boys right outside the National Museum of American Jewish History. PushBack protesters taunted We the People attendees based on crowd size, chanting “We got the numbers, we got the numbers.” Those chants were led by a microphone-wielding Daryle Lamont Jenkins, considered to be Public Enemy No. 1 to many white supremacists. “I f***ing hate racists and wanted to come support this,” said Bartolore, who lives in New York. Also traveling to Philadelphia for the protest were Elizabeth Lieb and Graham Clarke. The couple from North Jersey was celebrating their third anniversary, in part, by sporting homemade Gritty headwear. 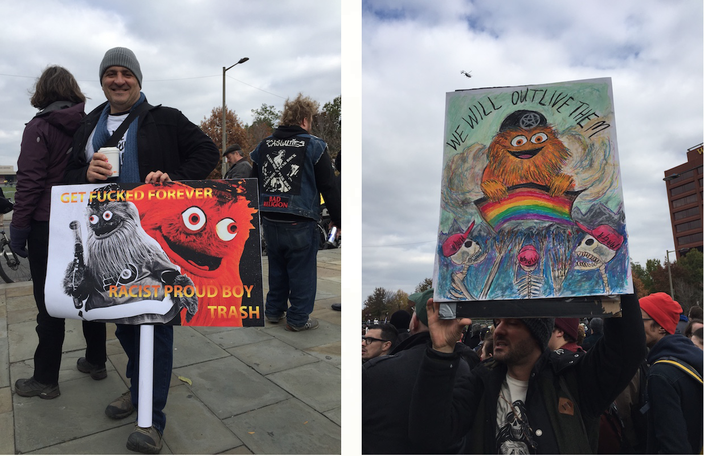 Inspired by Gritty, Elizabeth Lieb and Graham Clarke traveled to Philadelphia from northern New Jersey to spend part of their third-anniversary weekend at the PushBack rally. 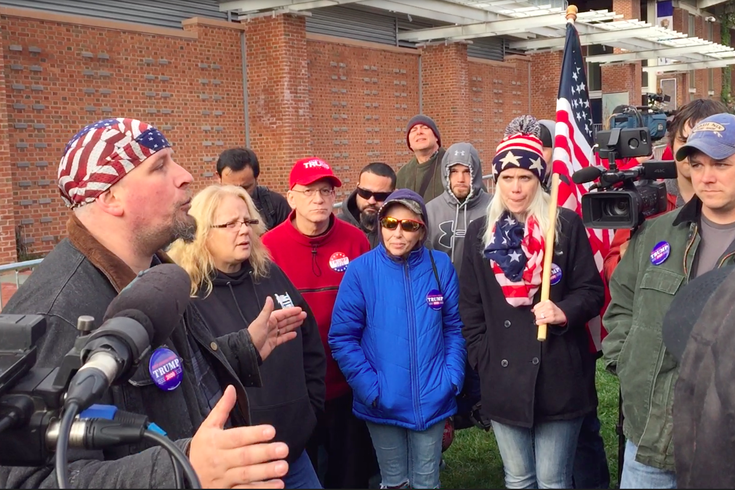 Over at the “We the People” rally, five U.S. flags could be seen blowing in the wind along with two Trump flags. After some delays in letting press into the event, reporters finally made their way into an area behind several sets of metal fencing. “We don’t care if you’re media. We just don’t want f***ing Antifa coming in because it’s happened before and they started trying to attack people,” said a man in a “security” jacket moments after ripping a cellphone out of the hand of person asking to get into the area. Many speakers had already taken the microphone, but just after 12:30 p.m., it was Bobby Lawrence’s turn. A 'We the People' rally attendee speaks to reporters at the event. He spent several minutes shooting down reports he’d seen on social media about members of his group infiltrating the protesters. The man who traveled to Philly from south-central Pennsylvania also boasted about his social media reach, which he said brings millions of impressions a month. He also noted that the group "is not advocating violence against anyone." After Ronnie Brown of Juniata County likened the protesters to the Colonial-era British, an organizer who said he’d traveled up from North Carolina to attend the rally turned the microphone off and offered some closing advice to the rally goers. He said he’d just spoken to police who urged them to leave in smaller groups so as not to antagonize the protesters.